Home Events So, you would like to fly into AirVenture at Oshkosh? You’ve not done it, but there it is, on your bucket list, maybe at the top. 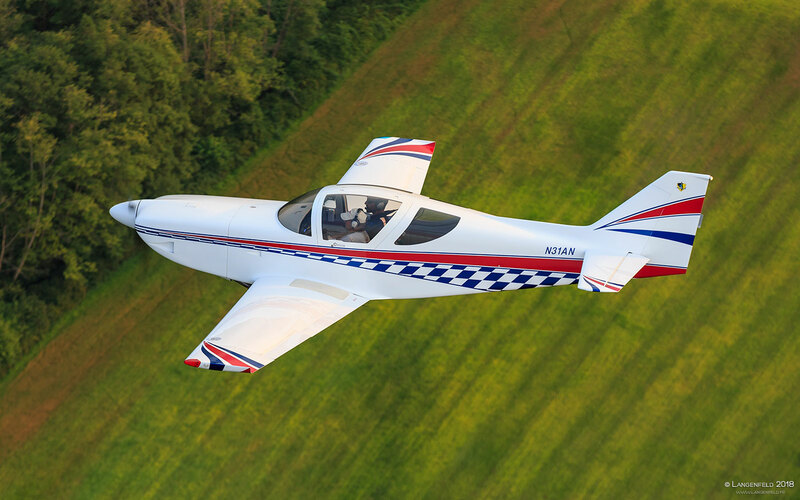 You want to fly your GlaStar, Sportsman or Glasair to AirVenture. Tens of thousands other pilots have done it over the years but why haven’t you? There are probably many reasons, but it’s time, you’re ready and this year, or maybe next, you are going to do it. The EAA fly-in convention was first held in Milwaukee, Wisconsin, in 1953. In 1959, the event moved to Rockford, Illinois, where it was held annually through 1969 before coming to Oshkosh. 2019 will be the 50th Anniversary of AirVenture at Oshkosh. 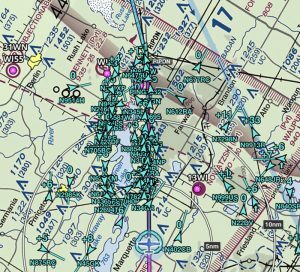 Pilots have been flying into AirVenture for almost 70 years and all things considered, it has been amazingly safe considering the thousands of aircraft converging in a very small area over a very short period of time. 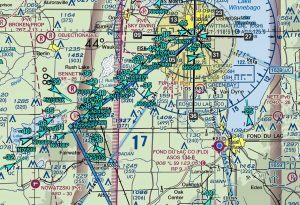 There’ve been accidents of course but for the most part, the EAA and FAA have worked out arrival and departure procedures that work reasonably well. That is of course, unless the density of arriving traffic increases to an unmanageable level, and it does occasionally do that. But more about that later. I am going to skip over general flight planning items and get right to the arrival part because that is where you really need to be ‘on your game’ as a pilot. 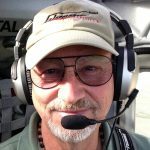 Most pilots on this forum should be aware of the usual checklist items and preparation required for a cross-country flight. One of the very first items is obtain and study the NOTAM. The NOTAM for the current year is published well before the event. You can either download and print it directly from the EAA website or request a printed copy in the mail. I suggest first timers also download or obtain a copy of the NOTAM from a recent year as it doesn’t change much if at all. A typical arrival might look like this. You navigate to RIPON intersection, get in line, follow the airplane ahead of you, maintain 90 knots and 1800 feet MSL unless you are flying a go-fast like a Glasair I, II or III, then its 135 knots and 2300 feet MSL. You do not broadcast or respond on the radio, listen for controller instructions, rock your wings when asked to. Then at FISKE, you are instructed to either turn for runway 18/36 or 9/27. You’re instructed to land on or near one of the colored dots placed strategically on the runways at various points (short, middle, long). Parallel taxiways are usually in use for landing as well, so if you’re asked to land on the taxiway, be sure you know how to stay on the center line as the taxiways are much narrower than the runways as you might expect. That’s a very simplified version of the Oshkosh VFR arrival procedure that has been in place for years. It’s important for everyone to read and know these procedures thoroughly prior to attempting to fly in. My first time flying into AirVenture was 2004 and the NOTAM and procedures haven’t changed much if any in all that time as far as I can tell. AirVenture always begins on a Monday, but most of the traffic arrives on Sunday and that may be the very worst time to attempt to fly in because the traffic is usually at the highest density. Besides the shear numbers of aircraft flying in individually or in small flights, there are the mass arrivals with anywhere from 20 to 100+ aircraft (The Bonanza group is usually the largest) all arriving as a group, some of which schedule to arrive Saturday but Sunday is always the busiest day for arrivals. Dan Dudley, long time member of the group and experienced Glasair aircraft pilot has been hosting a mass fly in for our members for years on Sunday. Not only is it an alternative way to arrive but the Saturday night gathering is a great way to visit with old friends and meet new ones. 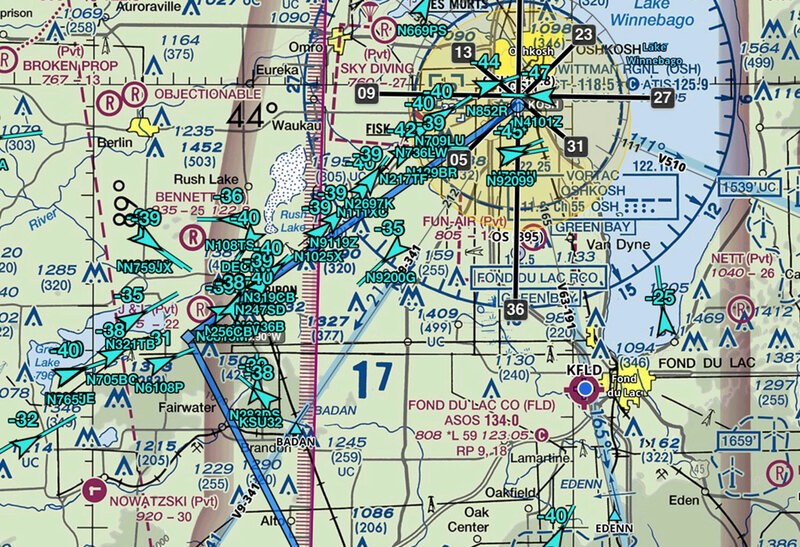 The Fisk VFR Arrival to Oshkosh seems to work very well, but when the density of aircraft increases like it did in 2018 on Sunday, then all hell brakes loose and very few aircraft get in to land at Whitman. When the density of arrivals increases to a certain point, the separation between aircraft in trail reduces to a very dangerous level and a lot of line jumping occurs and it very difficult to maintain safe spacing. I think it’s both inadvertent and intentional. Pilots are focused on beginning the approach at RIPON but there are planes lined up for miles in all directions heading for that intersection and when they converge, it can be very chaotic. I encountered almost the same thing about 10 years ago as well as in 2018. However, the delay 10 years ago was not because of weather but an airport closure on Sunday morning for about three or four hours due to an early morning fatal landing accident. The effect was almost the same. Aircraft arriving this past year had to contend with IFR weather Sunday morning preventing any VFR arrivals until sometime after noon. Thousands of airplanes were waiting at other nearby airports waiting for the weather to break. When Whitman Field finally opened, you can literally see what happened and how the image illustrates it. OMG! How could so many airplanes occupy the same space at the same time and not all be running into each other, falling out the sky in massive collisions and fiery death? Amazingly it seemed to work out, with no collisions, there was certainly a lot of stressed out pilots and controllers for most of that day and very few aircraft being allowed to land. 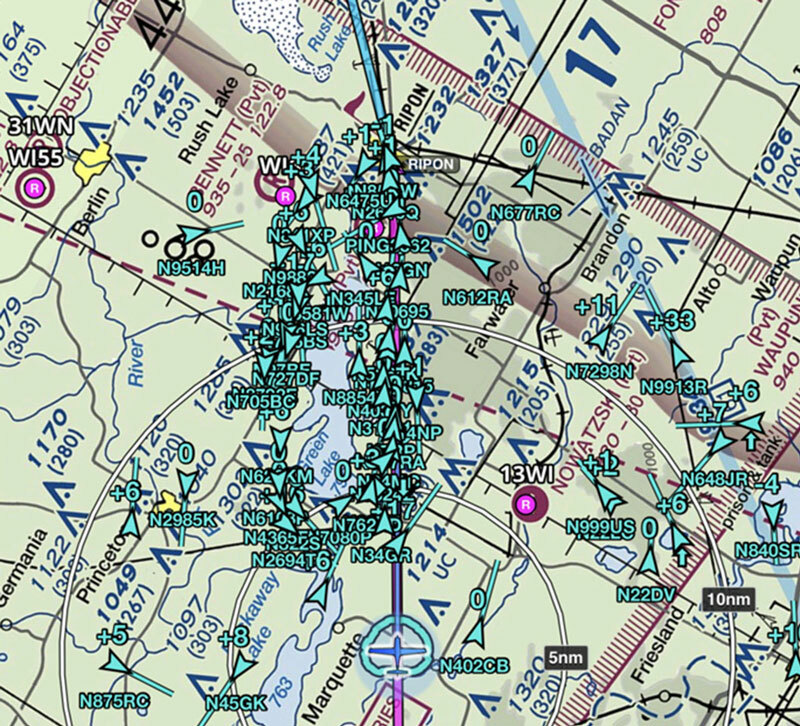 When there are just too many airplanes to handle and separate safely, the controllers will tell people to enter holding patterns at either Rush or Green Lake or both. I have been wanting to fly N31AN, my Glasair III since I bought it in 2016. I hadn’t been to AirVenture since 2008 and I’d never been there when I wasn’t working for Glasair Aviation or another company. The idea of getting there in six hours from Arlington, WA was very appealing. I remember well the last time flying in on a Sunday and arriving about midday. The fatal landing accident mentioned above had the airport closed all morning and they were just started allowing arrivals, and it was very chaotic, with airplanes lining up well before RIPON. Many pilots had been holding around the lakes for hours and were getting low on fuel. For some reason, instead of going to other nearby airports, landing, getting fuel and then heading back, I heard many pilots breaking protocol of staying off the arrival frequencies and in panicked voices calling in for clearances. The arrival controllers could not direct traffic and it was a huge mess. There was a lot of line jumping and airplanes coming at me from all directions and getting very close. That year I was flying a Sportsman, so I was able to slow way down with full flaps (as slow as 50 knots) allowing me to maintain spacing from the airplane ahead of me. Even though the controllers were turning many aircraft back to Rush and Green lakes for holding, I was able to continue and to get it in to land on my first attempt. I am convinced the ability to fly slowly and maintain minimum spacing (1500 feet in trail) allowed me to make it without having to go back and start over again like so many others. 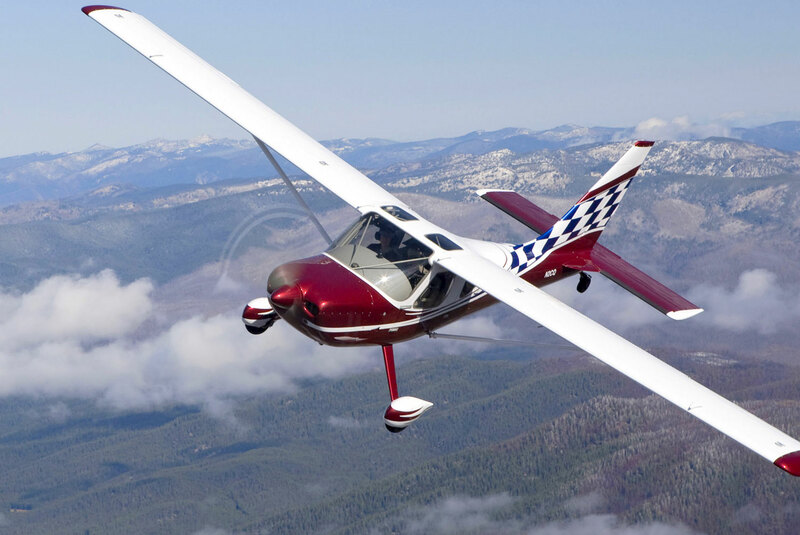 One of the many advantages of the GlaStar and Sportsman is the ability to safely maintain very slow airspeed, but you must be proficient in doing so to prevent a stall and a serious accident. Many of the fatal accidents over the years were arriving aircraft that got too slow and stalled too low to the ground to recover. Prior to my departure from Arlington, I knew the weather was going to be bad on Sunday and I somewhat expected the delay that I encountered. I had already decided that if I did encounter huge back ups when I arrived, I was not going simply go into the holding patterns but to land elsewhere nearby and wait till the traffic cleared enough for me to make it in. Sure enough, as I got close enough to hear the arrival controllers on the radio, I could hear stress in their voices, and they were turning most airplanes back to the holding pattern lakes or RIPON. However, occasionally I would hear them instruct an airplane to continue and then give clearance to a runway. I am convinced those lucky few were somehow able to maintain spacing behind the airplane in front of them, just like I was able to do in the Sportsman ten years prior when I arrived in similar conditions. Very soon after I heard what was going on, I decided to land and wait it out. It was about 5:00 pm local time and I know I had until 8:00 pm when the field closes for the day. I was very close to Wautoma, WI (Y50) so I set up for landing there. There were dozens of other aircraft there and it was apparent right away the airport was not equipped to handle so many sudden arrivals. The staff was overwhelmed and there just were not enough people to direct parking. A huge line up formed for the only fuel pump available. I waited there for roughly an hour. I had made arrangement to spend the week staying with some folks who rent a house. They offered to drive out and pick me up, but Wautoma is nearly an hour each way from Oshkosh and I knew if I had to exercise that option, I could get closer by going to Fond Du Lac. I decided at that point that I would take off again and make one more attempt to get into Oshkosh and if I could not, I would simply fly into Fond Du Lac, WI (KFLD). Hindsight now tells me that I should have made that my alternate in the first place. I’d never been into Fond Du Lac, but many, many pilots fly in there every year as an alternative to even attempting to fly into Oshkosh. There are others that go to Appleton, WI (KATW). However, while Appleton is larger and better equipped than Wautoma, I know that they too were understaffed and overwhelmed with all the additional aircraft that came in Sunday night. My second attempt to get into Oshkosh was about the same as the first so I immediately headed for Fond Du Lac. There were still a lot of airplanes going in there but it so much easier and relaxed compared to the “Fur Ball” at Oshkosh. They’re well equipped for large numbers of aircraft arrivals. They have plenty of parking and ground crews to guide aircraft to tie down spots. They have shuttle busses to take you back to the terminal and there’s a shuttle service that goes directly to Whitman (KOSH) running every thirty minutes. It’s obvious that the folks at Fond Du Lac have been doing this for years and everything runs very smooth there. The cost is $15 for one night or the entire week if you should choose to skip flying into AirVenture. By the time I got a ride to the terminal building at Fond Du Lac, my friends were waiting for me and it was a much quicker ride back to the house. I still wanted to fly into KOSH but had to figure out when to make my third and final attempt. I had a pretty strong inclination that trying to get in early Monday morning would not be a great idea as I had a feeling there would be still a lot of other pilots who like me, had to park their airplanes elsewhere for Sunday evening. I decided I would wait till Monday afternoon and see what the traffic was like. I arrived at AirVenture early Monday and found myself very near the shuttle station for the bus to Fond Du Lac. Impulsively, I decided to head down there and fly back up. However, on the bus, there were some pilots who had the Flight Radar 24 Application open on their phones and one could see the same kind of backup and high density of traffic attempting to arrive that occurred the day before. Someone else on the bus was listening to the Live ATC app and you could hear the radio chatter that sounded exactly like the day before when I was attempting to get in. I told myself that I was a numskull for being on the bus at that time when just the night before I made the decision not to come down early. So, I just stayed on the bus and went right back to AirVenture. ($30 and about an hour down the drain). About midday, I noticed there were very few planes overhead flying in, so I got back on the bus to Fond Du Lac. By the time I was ready to depart for the four to five-minute flight from Fond Du Lac, back to KOSH, it was about noon. This time when I got to RIPON, it was so quiet on the arrival frequency. So quiet in fact I could not believe my ears. Flight time between RIPON and FISKE is only a couple minutes even in slow airplane so when I did not hear anyone on the ground acknowledge my presents overhead, I called in and asked if they saw me. A controller came back right away and asked me to rock my wings. I complied and then to my surprise the controller gave me my choice of runways, I could either land 36 or 27. I chose 36. I did not see that coming. What a difference 24 hours would make! From now on, If I arrive on Sunday and it is utterly congested, I will be prepared to head to Fond Du Lac and wait till Monday afternoon to fly in. Perhaps first timers will want to consider that or join Dan Dudley’s group arrival party. There is no reason to ever get yourself into the “Fur Ball,” especially if you are a low-time pilot not used to flying in a high-density situation like the Oshkosh arrival. Everything in this article can also be applied to Sun and Fun at Lakeland, Fl. While not as large, there are still times with very high-density arrivals. The Warbirds have their own arrival procedure that is east of the RIPON-FISKE arrival, so if you have an aircraft that is former military aircraft or even in warbird colors, you may qualify for that arrival. And there is even some talk from the EAA that they may open that arrival corridor to other airplanes to reduce congestion. Watch for news of that possibility in 2019. Here are some additional safety tips from the NTSB for arriving and any major fly-in event.